Late last year I wrote a short article for Pattern Review in conjunction with the "One Yard Wonder" contest that the O! Jolly! Shop was sponsoring on the Pattern Review site. I discussed various strategies to squeeze an entire garment out of a single yard of fabric. One strategy was to consider using a zero or minimum waste layout with few, if any, scraps. For many, many years I machine knitted only fully fashioned garments, where the pieces of the garment are knitted to shape. Machine knitting and fully fashioned garments were the topic of the earliest posts on my other blog. Here the only leftovers were leftover yarn, and leftover yarn can easily be incorporated into a new design. Makers through the years have worked to avoid wasting materials to a greater or lesser degree. Whether designing an elaborate layout and cutting procedure to reduce the absolute quantity of materials used or by actively recycling and reusing leftover materials (See Scraps No More - Part 1), minimizing waste needs to be a priority. Though I always recycle and reuse, until now I'd never made the effort to design a garment with my layout informing the design. In the past I've researched designing with rectangles only, but I'd never gone beyond a basic drop shoulder sweater and a two-rectangle shawl. New fabric was in the shop that I'd taken the time to develop with care. Frankly, I just couldn't wait to cut and sew it. So for my first project with Saint Cloud sweater knit, I challenged myself to explore a very simple, very low waste cutting layout. I began with a piece of fabric that was approximately 43 inches wide and 44 inches long. 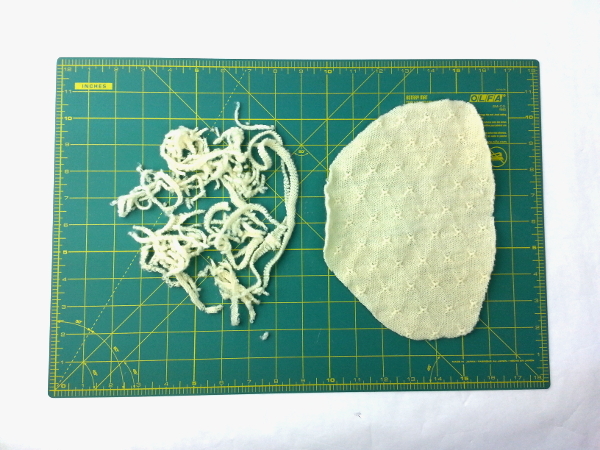 Here are my scraps from the entire project laid out on an 18" x 12" cutting mat. An Interesting Exercise, I Wore It the Same Day I Finished It! Well, it was a quick one to sew. And I enjoyed the challenge. I loved thinking of the project as a puzzle. I pondered the layout for a couple days and decided to go with something very simple. 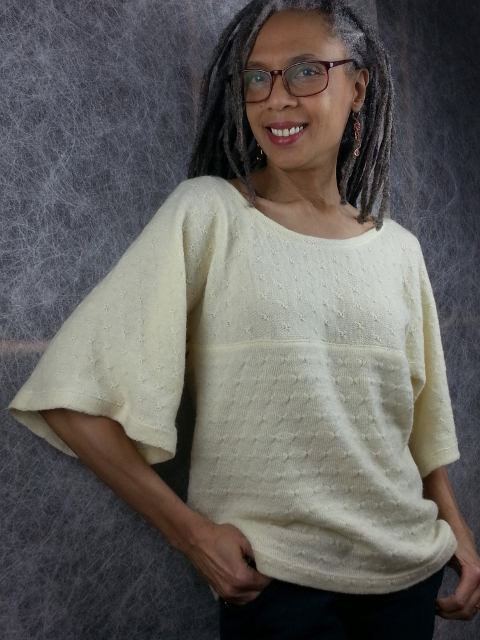 I always recommend "simple" for sweater knits, allowing textures and other fabric design elements to shine through. Except for the neckline there were only straight lines to cut. 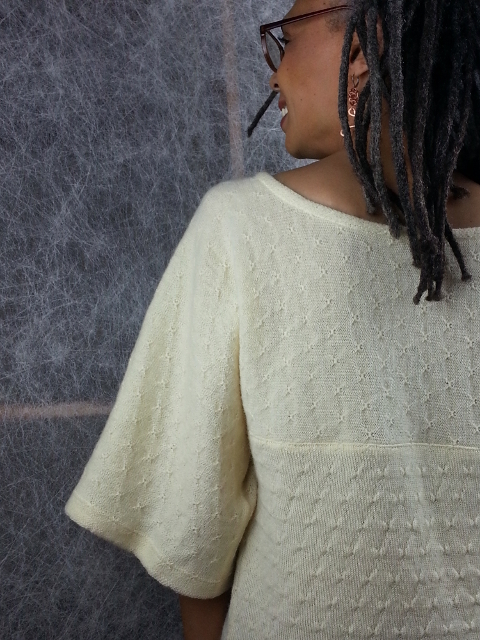 The neckline was finished with a self binding. I used a quick and neat twin needle hem. I've discovered, dare I say, a failproof(!) way of using a twin needle with a sweater knit. In future posts I'll share more info on both the layout (update: plan and template posted Apr 29, 2017) and some tips on the neat twin needle finish. Join the O! Jolly! email list for news, sweater sewing techniques, and discounts on O! Jolly! fabrics. Great Plan! I have some sweater fabric I've been hanging onto for years--now I can make something simple and wearable for the fall. Thanks for posting this. You're welcome, Robin. Glad you find it useful! Do let me know how it goes over on the "How to... Sweater" page. This is great news as I plan on making some fabric from wool/rayon mix yarn. So far 1x1 looks good at TD5 on standard. Oh, another machine knitter! 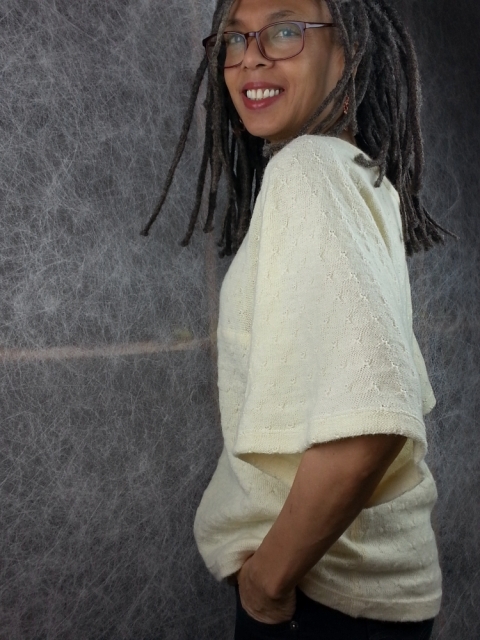 You may enjoy my mk blog Knitting in the Fastlane (archives only).